A deciduous tree with a broadly pyramidal habit. The fragrant early spring flowers have large, yellow petals, with goblet shaped blooms six inches across. They are held above the dormant branches, perched like butterflies. 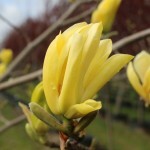 It is considered one of the better yellow magnolias. It prefers a moist, organically rich, well-drained soil in full sun to part shade.